The original Post Office at Sembach AB, and currently "Community Bank-Sembach." The original Post Office at Sembach in the 50's, this building went through some significant use changes over the years. This building became the Sembach Class 6 liquor store in the 60's, and then transitioned into the base bank. It is currently "Community Bank-Sembach." For visitors with a web browser of 4.0 or better (Netscape and I.E. ), you will load a current picture of the building by letting your mouse curser scroll across the image above. 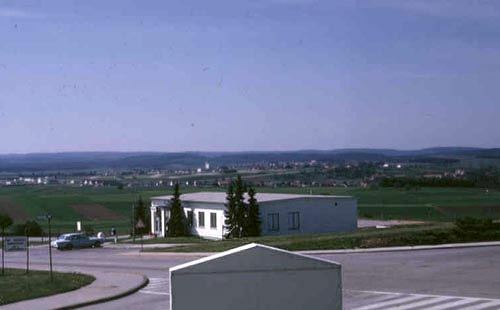 Original 1968 photo by Bob Bois, MSgt (Ret). Current Image courtesy of G. Thomas Utech II.